Happy Thanksgiving!. Here are a few Thanksgiving-themed chipmunk pictures I managed to dig up. Enjoy! And have a great Thanksgiving! ^u^. 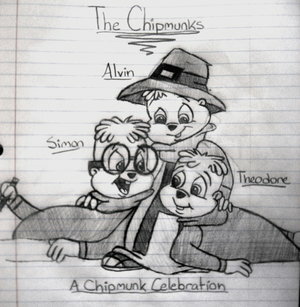 Wallpaper and background images in the Alvin and the Chipmunks club tagged: chipmunks alvin simon theodore brittany jeanette thanksgiving food for thought. This Alvin and the Chipmunks photo might contain giornale, carta, riviste, tabloid, straccio, rivista, anime, fumetti, manga, and cartoni animati.